Jude Law, Gemma Arterton, Alexandra Burke and Cameron Mackintosh are among a host of stage and screen figures vowing to protect the “past, present and future of live theatre”. 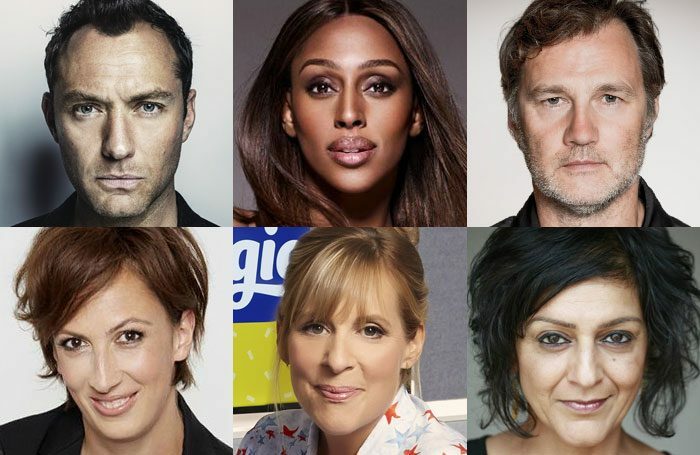 Actors David Morrissey, Lenny Henry, Mel Giedroyc, Meera Syal, Miranda Hart and Bill Nighy also feature on the first list of ambassadors to be announced by the Theatres Trust. The 24 ambassadors have pledged to work with the Theatres Trust to protect theatres by raising funds for the grants and support the trust provides. Law described stage acting as “the highlight of [his] job” and said the UK had an important role to play in celebrating and protecting theatres in the future. “As a child, I was taken to the theatre regularly – to more intimate spaces such as the Young Vic, Greenwich Playhouse, the Bush and the Gate, and also historic and magnificent spaces, such as the National Theatre and Wyndham’s Theatre. “Sharing the experience of live performance with others made me feel like part of a community and was fundamental in building in me a sense of who I was as a person,” he said. The list also includes playwright David Hare, Young Vic artistic director Kwame Kwei-Armah, lyricist Tim Rice and performer and broadcaster Elaine Paige. Theatres Trust director Jon Morgan said the ambassadors would help raise awareness of the “vital work” that needs to be done to protect theatre buildings. Also on the list of ambassadors are Samira Ahmed, Alan Ayckbourn, Michael Ball, Pippa Bennett-Warner, Matthew Bourne, Jo Brand, Jack Dee, Beverley Knight, Siobhan Redmond and John Simm. The Green Room: How do you learn your lines?